What are you doing New Year's? The correct answer is "staying warm at all costs", because the Ottawa weather reports have not been too kind! A wind chill that feels like -33 degrees is not something I'm too keen on. While I'm usually an advocate for fashion over function, I'd rather not ring in the new year with a fresh case of frostbite. That said, I still want to get glammed up for the occasion! I've been rooting around in my wardrobe and I found some pieces that look smokin' hot, even in the iciest of forecasts. Of course, I want you to ring in 2018 in style (and warmth), too! 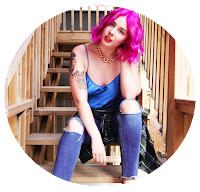 I've even found scouted out some similar items for you to shop each look. 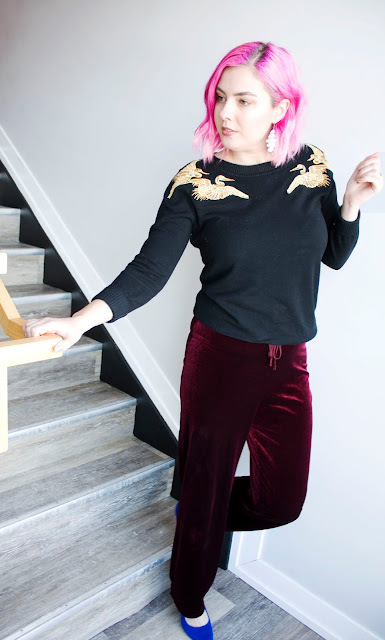 Velvet is a hot trend right now, and I can guarantee you'll be seeing a lot of velvet slip dresses out and about on NYE. 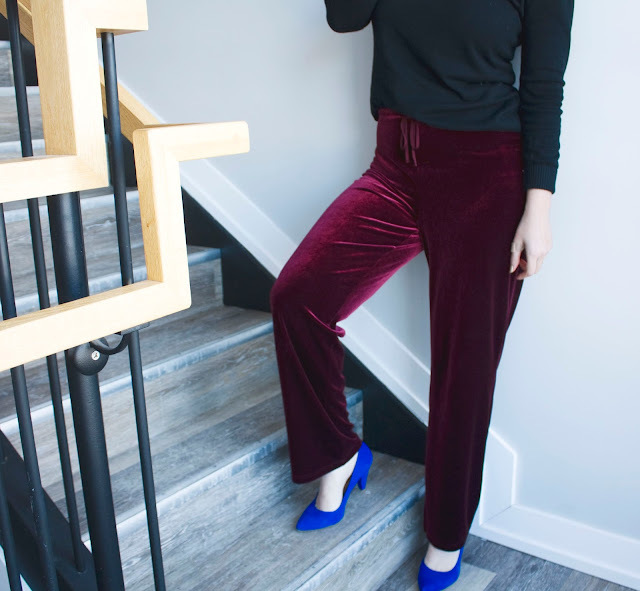 Rather than blend in with the crowd (and risk freezing), why not opt for a pair of velvet trousers instead? These are a great statement piece, as they add that touch of texture and dress -up an otherwise basic ensemble. I love to pair these with a variety of tops; crisp blouses, chunky knit sweaters, or even a fun embellished tee! You'll be amazed at just how versatile they can be. Plus it's like wearing PJ pants, and nothing is more comfortable than that! Who says the cold weather adornments have to stay on the coat rack all evening? 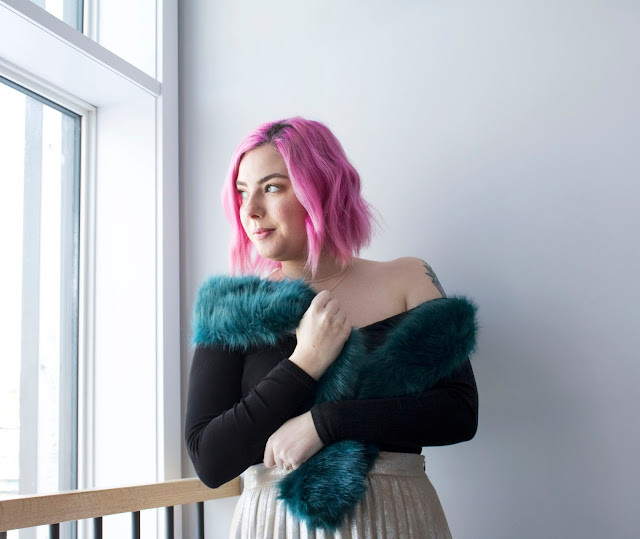 You can easily keep your fur accessories on all night long, even if just to keep extra warm. 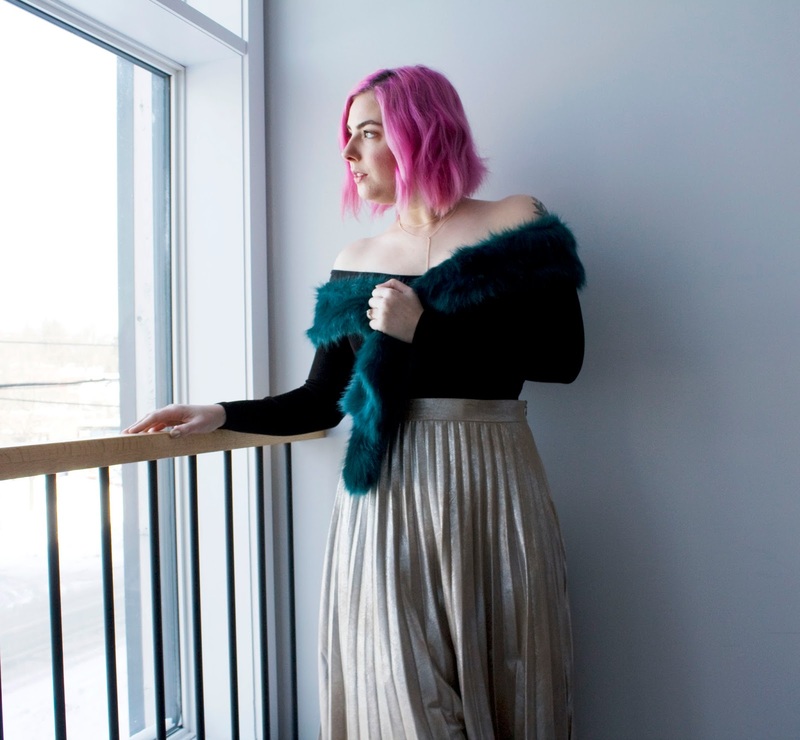 This faux fur scarf I scored at Target (RIP) doubles as a super chic shawl, so I can stay cozy and feel glamorous! Plus I love the vibrant jewel-tone teal colour, it compliments my metallic skirt so beautifully! 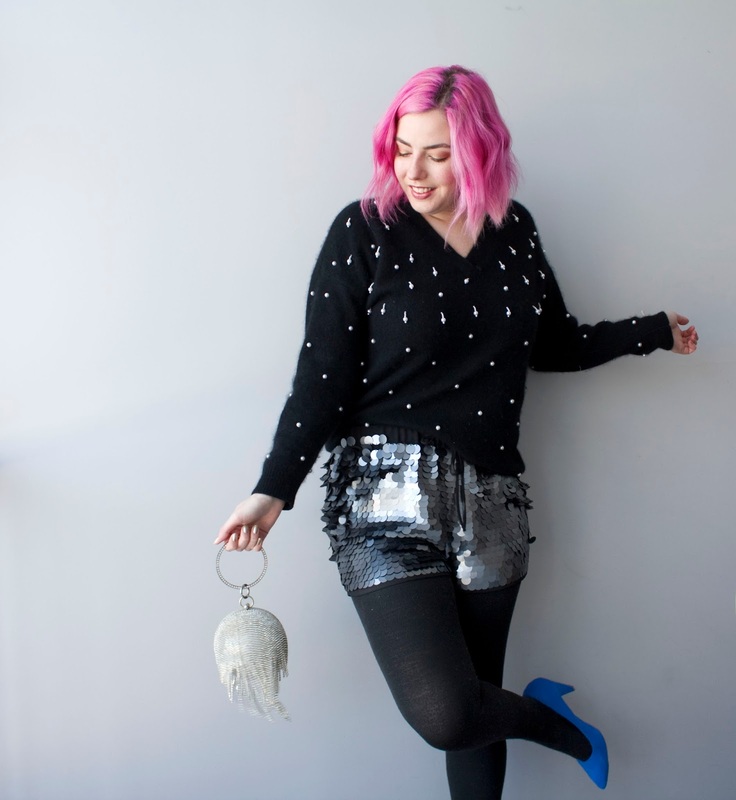 Thankfully there are a ton of ways to incorporate something fuzzy & fabulous into your NYE style. Whether that be a fur coat, a handbag or even a pair of shoes, you'll find something that looks and feels extra nice! All the items below are faux, too! If you insist on wearing a dress for the occasion, I cannot recommend thermal tights enough. You can find them just about anywhere, and I find they last much longer than regular hosiery because of the thicker knit. I love these because while they have a very plush lining, they aren't bulky. They look just like a regular pair of opaque tights, but much, much warmer. I have at least 2 pairs on hand in the winter, because I even like to wear them as long-johns under my pants if it's really cold out. If you can't find fleece-lined or thermal tights, opt for a pair with a high denier (this tells you how thick/thin they are). The higher the denier, the warmer they'll be! Wearing these also means you can ditch the razor for the evening. I just cut 10 minutes out of your getting ready time, you're welcome. Hope you all enjoy the festivities ahead, and ring in the new year with style! Please stay safe and cozy out there, and drink responsibly as always. Love the velvet trouser and green shawl!!! I’ve actually seen the H&M trousers and was looking at buying them it decided against it. Now I regret it ! I honestly want more pairs, myself! They're just so damn versatile! They are definitely effective longjohns (and they're much less bulky)! I've been wearing them under my jeans all week because of how cold it is here in Ottawa! Oh yes! I remember itchy velvet, too! I find it's all a matter of how the pants are lined; thankfully I haven't had any issues with mine. girl, I love the title of this post! ahah and I have to admit that I just love all of your sugestions! and your hair! stunning! Thanks so much, lovely! I'm glad you enjoyed reading it! Those velvet trousers look so comfortable! They really are! I love that I can wear them as cozy, around-the-house pants, or dress 'em up like this! They are an absolute winter staple!